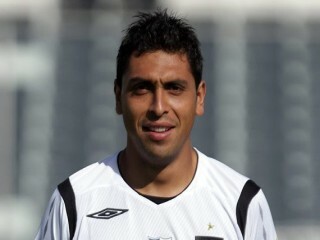 Gonzalo Jara (born August 29, 1985) is a Chilean footballer who plays for West Bromwich Albion as a defender. A tenacious and highly-versatile national team regular, who can be used in central defence, at full-back or as a midfield ball-winner. He has captained the side on occasion and has the ability to command respect from those around him. West Bromwich Albion became his first posting at a European club, as he joined the side who fluctuate between the Premier League and Championship divisions in England from Colo Colo last summer in a £1.4 million deal and he has enjoyed a decent first season on foreign soil. In 2005, Jara represented Chile at the 2005 FIFA World Youth Championship in the Netherlands, scoring a goal in Chile's 7–0 victory over Honduras. He also played for Chile in Copa América 2007 against Ecuador, Brazil, and Mexico as well as the 2010 World Cup Qualifiers, against Peru, Uruguay and Paraguay. Jara was Chile's captain in the prestigious 2008 U-23 Toulon Tournament, where he has played in the 5–3 victory against France, as well as the 2–0 victories against the Netherlands and Japan. He missed the semi-final match versus Côte d'Ivoire due to yellow cards. He scored his first international goal for Chile against Venezuela during the 2010 CONMEBOL World Cup qualifiers. Colo-Colo agreed to transfer him to English Championship team West Bromwich Albion for a fee of $3 million in August 2009, but the buying club chose not to proceed with the deal. However, they later resurrected the deal and Jara signed for Albion for a fee of £1.4 million on a three-year contract. He scored his first goal for West Brom against Leicester City on 7 November 2009. Chilean fans were sent into a panic in February when the news broke that he had broken the third metatarsal in right foot, though he is expected to be fit in time for the kick-off in South Africa. View the full website biography of Gonzalo Jara.